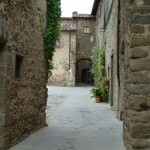 The village of Volpaia (“fox’s place” or “fox’s lair”) probably emerged as a base for pilgrims on the road between Siena and Florence. 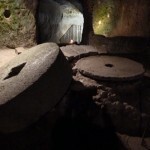 It is first mentioned in a document dated 1172, and wine has been continuously produced in this village since that time. Volpaia’s 15th-century Church of Sant’Eufrosino boasted an altarpiece by Cosimo Rosselli (1439-1507), which is now located at the Instituto Nazionale di Studi sul Rinascimento (National Institute for the Study of the Renaissance) in Florence. Castello di Volpaia’s fermentation shed remains intact from its early days; its roof was removed to bring in modern steel vats without destroying the building. Chianti Classico, Chianti Classico Riserva, and the Super Tuscan Balifico wine are fermented in these vats for 14 days before being moved to large oak barrels that must be assembled in the building. The barrels are topped by a glass device invented by Leonardo da Vinci that measures the wine level (image below). Super Tuscan wines are new wines aged 18 months; their blends are guided less by rules and tradition and more by the personal taste of the winemaker. Balifico, for example, is 65% Sangiovese grapes, while a Chianti must have at least 80% Sangiovese. 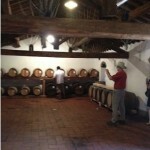 To make Vin Santo, Trebbiano and Tuscan Malvasia grapes are harvested late in the year and hung up in bunches from chains to dry for five months in the Vinsantaia, an attic space in which the temperature fluctuates widely (image below). These temperature changes increase the sugar content. 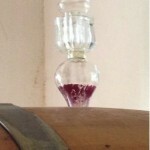 In February, the freshly pressed “must” joins the “mother” in small oak barrels and ages for five years. Lovely street in Volpaia, the fox’s lair. After the tour, a compulsory tasting! A contemporary question that demands interdisciplinary perspectives is that of environmental sustainability. The Tuscan government has demonstrated a commitment to the environment, but which environment should be sustained? This question is complicated by thousands of years of human shaping of the Tuscan landscape. Beth asked us to examine the landscape features and vegetation around us. What we saw was clearly a “cultural landscape” featuring groves of cultivated trees, vineyards, pastures, and other ecologies shaped by cultivation, as well as mountains and forests. Drawing upon survey records from 1832 and aerial photography from the 1950’s, the final period in which traditional agriculture was practiced in Tuscany, Beth observed several landscape features created by humans. At higher elevations, pastures were created by burning forested mountaintops. The practice of polyculture in Tuscany included trees such as chestnuts grown to feed livestock. Since the 1950’s, however, neither chestnut groves nor pastures are as often maintained due to outmigration from rural areas. The absence of agriculture increases the soil’s vulnerability to mudslides; on the other hand, decreasing pastureland has led to much more forestation. Montefili Agriturismo and vineyard of Roberto and Elena Bencivenni, in Chianti. 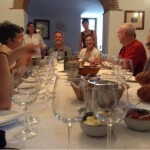 Roberto Bencivenni told the group about his family’s move from the city of Florence to a 20-acre Montefili farm in the Chianti region, where he and his wife Elena grow grapes and olives and run an agriturismo (http://www.montefili.it/). When they bought the property in 1994, the old farm buildings were in decay and the soil was full of large rocks. 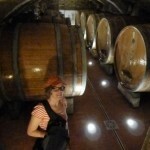 After 14 years, the buildings are restored, and the soil produces Sangiovese, Trebbiolo and Canaiolo grapes and olives. The Bencivenni either sell their grapes to winemakers, or they take their grapes to a wine production company that makes the wine exactly as they want it. Robert explained that winemaking is much more scientific now that it was 30-40 years ago. 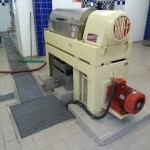 It is too expensive for them to buy the machinery needed to produce wine, so they have it made instead. The group tasted the Montefili Chianti Classico, and it was delicious. Montefili Chianto Classico DOCG is made from 100% Sangiovese grapes, the standard for Chianti since 2009. Before that, the standards established by Bettino Ricasoli in the 19th century stated that Chianti Classico could be made from a combination of Sangiovese, Canaiolo, Trebbiano and Malvesia grapes. When the standards changed in 2009, many viniculturists, the Bencivenni included, had non-Sangiovese grapevines that they could no longer use to produce Chianti Classico DOCG. The current preference for the amount of alcohol in wine is 13.5%. Roberto noted that with small production, it’s hard to get the alcohol level, which depends on the sugar level in the grapes, consistent from year to year. This is not a problem for larger, more commercial wine companies. Consequently, finer wines often have variable alcohol levels because they are more likely to be handcrafted and dependent on the grape quality of that year’s harvest. 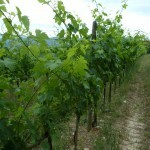 Most of the vines on the Bencivenni’s farm are 44 years old. Since the Chianti Classico regulation change in 2009, Roberto has planted two new acres of only Sangiovese grapes. 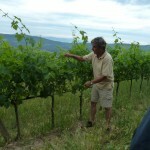 Roberto took us out to the vineyard and showed us how he prunes and trains the vines (all by hand). 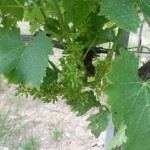 Each vine has four shoots, and he has to get just the right amount of sun on each plant and just the right amount of air between the grapes to avoid the growth of fungus. They spray the grapes with a fungicide in August. 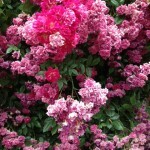 They do not spray for insects. This year they went organic and stopped using herbicide to control the growth of grass and weeds in the vineyard. 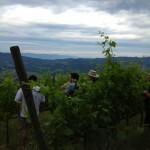 Roberto also noted that the EU subsidizes the start of new vineyards. But even with this financial assistance, growing grapes on a small scale as the Bencivenni do is not a very profitable business because the price of grapes has decreased significantly in the past few years. Roberto explained that olives are much easier to grow than grapes. The trees must be properly pruned so that all parts of the tree get some sun. Olive trees don’t need much fertilizer. Olive trees grow only up to about 300-450 meters above sea level, and they are sensitive to cold. In winter of 1976, the temperature dropped to -15C, and many olive trees died. They did regrow, but there was another freeze in 1996, two years after the Bencivenni bought the farm, and their olive trees died. They replanted, and now the farm has about 300 olive trees. 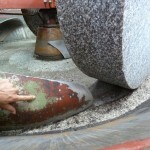 Last year they harvested about 150 kilos of olives by hand. 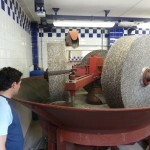 To make their oil, the family takes the olives to a frantoio in San Casciano, which makes oil the old-fashioned way by crushing them with stones. imagine the fragrance of this room…. Roberto and Elena have run the agriturismo since 2004. 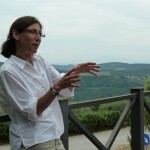 They explained that Elena took a course to certify the farm as an agriturismo; they had to demonstrate that they cultivate the farms themselves in order to pay less taxes. The agriturismo is most popular with foreign tourists. 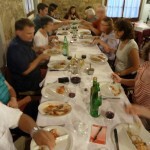 They’ve had only one Italian tourist since they began the agriturismo! Cita, Maria Bianca et al., 2004, Italian Wines and Geology [excerpt].